I haven't posted in a while. I finally got myself a new laptop, something I probably should have done about 8 months ago but was avoiding... Anyway, it has been a bit of a learning curve getting accustomed to the new features but I think I'm making progress. My 9 year old daughter was at home sick yesterday and when she felt up for it we decided to break open her new Polymer Clay kit that she got for her birthday. She had been experimenting with an older kit previously but this was my first time working with polymer. 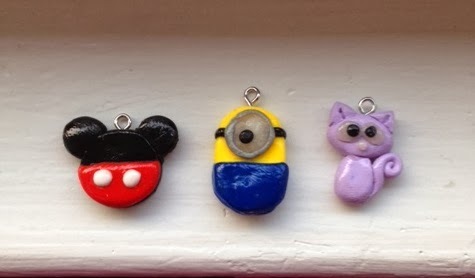 The first one we made was they Mickey charm, in honor of our upcoming trip to Disneyland. My kids have never been before so the are very excited! It was fun creating these and it sure made up for being stuck inside on a beautiful day!